Present-day Turkmenistan covers territory that has been at the crossroads of civilizations for centuries. In medieval times Merv (today known as Mary) was one of the great cities of the Islamic world, and an important stop on the Silk Road, a large road used for trade with China until the mid-15th century. Annexed by the Russian Empire in 1881, Turkmenistan later figured prominently in the anti-Bolshevik movement in Central Asia. In 1924, Turkmenistan became a constituent republic of the Soviet Union: the Turkmen Soviet Socialist Republic. When other constituent republics of the Soviet Union advanced claims to sovereignty in 1988 and 1989, Turkmenistan's leadership also began to criticize Moscow's economic and political policies as exploitative and detrimental to the Turkmen. By a unanimous vote of its Supreme Soviet, Turkmenistan declared its sovereignty in August 1990. After the August 1991 coup attempt against the Gorbachev regime in Moscow, Turkmenistan's communist leader Saparmurat Niyazov called for a popular referendum on independence. The official result of the referendum was 94 percent in favor of independence. The republic's Supreme Soviet had little choice other than to declare Turkmenistan's independence from the Soviet Union and the establishment of the Republic of Turkmenistan on October 27, 1991. Turkmenistan received independence from the Soviet Union on December 25, 1991. Saparmurat Atayevich Niyazov (1940 – 2006) was a Turkmen politician who served as the leader of Turkmenistan from 1985 until his death in 2006. He was First Secretary of the Turkmen Communist Party from 1985 until 1991 and continued to lead Turkmenistan for 15 years after independence from the Soviet Union in 1991. Foreign media criticized him as one of the world's most totalitarian and repressive dictators, highlighting his reputation of imposing his personal eccentricities upon the country, which extended to renaming months, which had been borrowed Russian words, after members of his family. The Manat was introduced on 1 November 1993, replacing the Russian ruble at a rate of 1 manat = 500 ruble. The manat was subdivided into 100 tenge. In 1993 coins were introduced in denominations of 1, 5, 10, 20 and 50 tenge. The 1, 5 and 10 tenge were struck in copper-plated-steel, with the higher denominations in nickel-plated-steel. The obverse of the coins carried a portrait of the president. 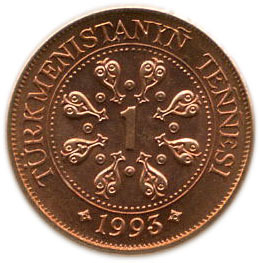 Turkmenistan, 1, 5, 10 and 20 tengesi, 1993. The reverses of the 1, 5, 10 and 20 tengesi coins featured various motifs. I do not know the significance of these motifs. The reverse of the 50 tenge coin depicts a Parthian drinking horn. After a period of high inflation, new coins of 500 and 1000 manat were introduced in 1999. The reverse of each coin depicted separate motifs. Such patterns and motifs seem to have become a feature of the country's coin design. After President Niyazov's death in December 2006, Gurbanguly Berdimuhamedow was elected the new president in February 2007. During the monetary reform of 2009, new coins of 1, 2, 5, 10, 20 and 50 tenge were issued. Bimetallic 1 and 2 manats coins followed in 2010. The 1, 2, and 5 tenge are nickel plated steel while the 10, 20, and 50 tenge are made of brass. Instead of depicting the current head of state the coins feature a map of Turkmenistan with the Independence Tower superimposed in front of it. Before we look at the new coins, it is worthwhile taking a look at the flag of Turkmenistan. A year after independence was regained, in 1992, Turkmenistan adopted a new national flag of extraordinary complexity. In the hoist of a relatively straightforward green flag with a white crescent and stars (symbolizing Islam) are placed five traditional carpet designs or 'guls'. The hoist stripe itself is dark red, while the guls are primarily in black, white and orange. Turkmenistan is famous for its carpets and each tribe has its own distinctive gul. Since the five guls in the flag are reportedly named after five tribes, they presumably stand for the various tribal groupings in the country. Disgracefully, the President got sick of the flag after only 5 years and decided to alter it. This desire to change the flag is typical of dictators in third world countries. In January 1997 an olive branch motif was added to Turkmenistan's national flag. According to a presidential decree, the olive branch is to symbolize the peace-loving nature of the Turkmen people as well as the country's "neutral" status. Changes to the Turkmen national anthem and alphabet were also made by presidential decree. The common obverse of the new series of 2009 shows the Independence Monument, superimposed over a map of the country. The design also features the guls from the national flag. The reverse of each coin depicts a different motif, which is repeated either side of the date. Again, I do not know the significance, if any, of these motifs. Below you can see the 1 tenge coin of 2009. 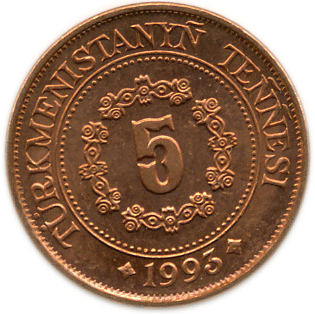 The reverse of the 2 tenge coin features six rosettes. An unusual set of motifs graces the reverse of the 5 tenge coin. 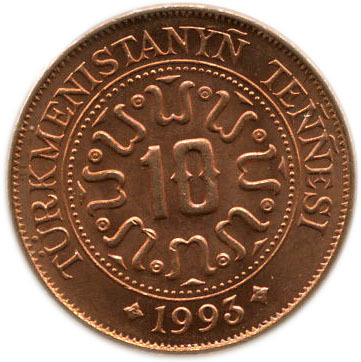 The motif that appears on the reverse of the 10 tenge coin appears to represent a costumed female doll with a face. The reverse of the 20 tenge coin. Yet another motif on the 50 tenge reverse. What does it represent? A crown, perhaps?